Go all in and use our easy label designer to create your own personalized labels for these standard decks of cards! 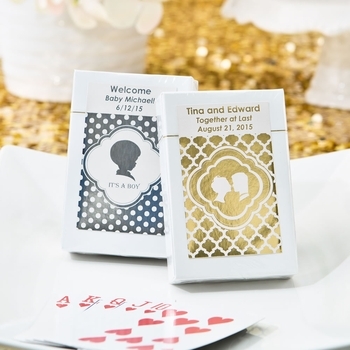 A wonderful keepsake for your baby shower guests, each box label contains the graphic, text, and date that you choose. Printed in vibrant gold or silver. Each deck measures 3 1/2 by 2 1/4 inches and comes in a plastic box. The peel and stick labels will be precut and are easy to apply. Note - Assembly required: You apply stickers to each candle. Have fun and open the label designer to begin seeing what your design will look like before you buy. Minimum order is 50. Includes free shipping.